Let me ask you a question: how is your holiday gift guide pitching going? Honestly, now: Are you taking action? Are you getting responses? Do you even know where to begin? Now let me tell you something: My Press for Success PR students are killing it in their holiday gift guide outreach: They’re finding the right people to pitch to at magazines, they’re reaching out with solid pitches, and they’re getting responses – even from O, the Oprah Magazine – a holiday favorite! Do you know how they’re doing it? It’s not magic, and it’s not wishful thinking! They are using the PR strategies, skills, and email scripts I taught them! Because it’s my birthday month, and because I want YOU to experience the same publicity and small business success as they have, I’ve bundled the most essential of those lessons, shortcuts, strategies and email scripts into an essential online class and I’m giving them you right now, for FREE right here in this post! Let’s call it an early Christmas gift! Watch the class (it only takes about an hour), download the companion guide, review and customize your email scripts and get ready to take action! There is no time to waste – the magazines are working on these issues as speak! How to Do Your Research: Get to Know the Outlets & Media Before Pressing Send! 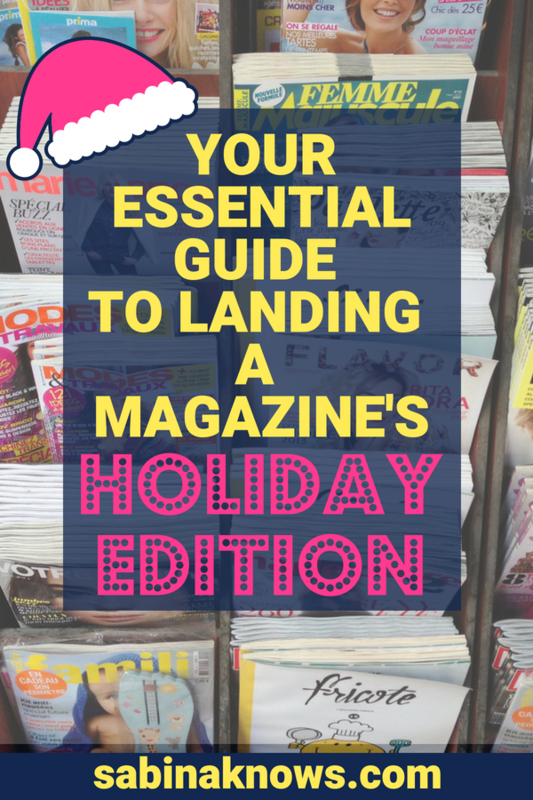 Who to Pitch: How to figure out who at a magazine (or blog) is working on holiday stories. How to Pitch (STEAL These Email Scripts): Sabina’s Simple & Successful Pitch Script Template – Customize it and make it your own! I’ve Pitched, Now What? What to do after you send out the pitch. GO FOR IT! Take this token of PR Love with you…Oh yes, watch this class and get a major student-only bonus to kick your PR into a more effective and efficient gear! Download your Companion Guide (and take notes along in it) HERE! View & Download Your “Contact Ask” email script HERE! View & Download Your Holiday Gift Guide Sample Pitch email script HERE! How is your holiday PR outreach going – or is it going yet? What publications are your goals?